When you are pulling a trailer and you start down an incline you naturally start to apply your brakes slowly so that you can slow how fast your vehicle goes down the incline. The problem is that the trailer behind you does not immediately start to slow down and it will begin to push against you and it can even try to come around you. 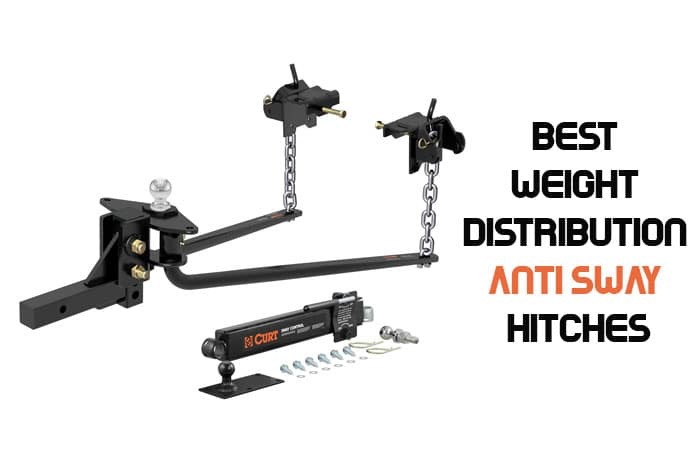 The best weight distribution anti sway hitch will stop your trailer from moving out of the lane and position that it is supposed to be in, and will keep the weight of the trailer load evenly distributed so that it is not pulling against just one portion of your vehicle frame. Anti-sway trailer hitch reviews help you to know about the new and innovative features that are now being designed into the anti-sway hitches. 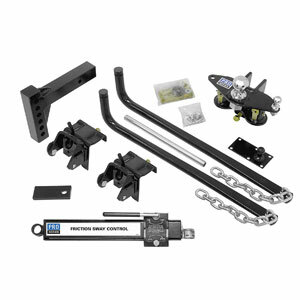 The pre-installed components that come with the EAZ LIFT 48058 1000 lbs elite kit are impressive because this saves you a lot of time when you are installing this weight distribution anti-sway hitch. The U-bolts and the chain packages that come with the hitch come already installed onto the spring bars. The hitch ball and the control ball come already installed and torqued to you’re the perfect specifications and they are on an adjustable ball mount so you can be assured that they will work on the vehicle you drive. All of the mounting hardware that you need to install this device comes with the kit. The distribution hitch is made from a variety of engineered steels that have undergone a series of grueling checks and stress tests to determine their strength and durability. They are further crafted using processes of precision drilling techniques and forged rolled bending to insure that the final product is as strong as it can possibly be and capable of doing exactly what you need it to do. .The bolt together hi-low shank has a drop of two and a half inches and a rise of five and a half inches with a shank size of two by two inches and a length of ten inches. The hitch kit is very easy to install just follow the detailed instructions included in the kit. This kit is specifically designed for a tongue weight of not more than seven hundred and fifty pounds and a gross trailer weight not exceeding ten thousand pounds. The distribution weight anti sway bar weighs only one hundred and two pounds. When you get the item it has a torqued sway control ball that comes preinstalled and it comes with a 2-5/16th hitch ball, and the necessary U-bolts and safety chains. This kit also includes your friction sway control and the mounting hardware you need to put the hitch in place. Once you have this hitch attached to your vehicle you will be able to tow your trailer in a safer manner. You will not worry about your trailer walking out of your lane because of the road conditions and when you are driving through mountainous regions you will be certain that you can travel down the mountains safely at a speed that is manageable for you. This weight distribution and sway prevention kit measures at 33.5 inches, by 11.2 inches, by 7.5 inches. It is the perfect size for the majority of non-commercial towing needs. You can use it with travel trailers, trailers designed to carry equipment, boat trailers, and practically any trailer designed to be towed behind your vehicle. The traditional chain style hitches have safety chains that attach the trailer to the hitch so that the trailer is less likely to become loose and get away from the vehicle. These hitches are not designed to stop a trailer from swaying behind your vehicle. Sway is often caused by the road surface. Sometimes a road will have slight imperfections in the surface so the trailer will follow the grooves of the road and will sway to one side or the other past the vehicle. This is unsafe and can cause accidents, and most peo9ple who pull a trailer on a regular basis know to reduce their speed to help reduce the sway but that means your travel time is increased. The Pro Series 49903 complete weight distribution kit will give you everything you need to improve your towing no matter what road surface you are traveling. You will increase your safety and reduce the chances that you will have or will cause an accident while you are traveling. 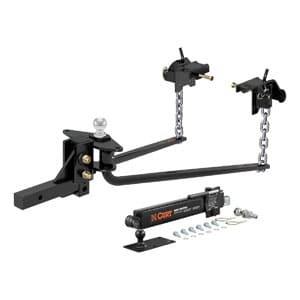 The kit comes complete with a preinstalled and torqued sway control ball, as well as a 2-5/16th hitch ball and the U-bolts and chains you need to use the hitch. You also receive all of the mounting hardware that you need to install the hitch properly. Some of the weight distribution bars and the anti-sway hitches are good at helping you tow the trailer behind your vehicle but when you start to back up or make a tight turn with the trailer then those bars can become problematic. 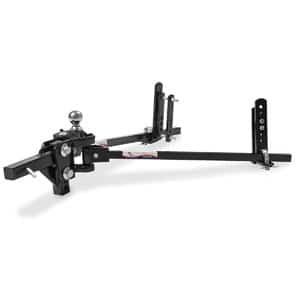 This weight distribution and anti-sway hitch will not create any turning restrictions and you will have full control of your trailer when you are backing it up or parking it. The e2 hitch creates a sturdy connection between the trailer and your vehicle so that the two items work in conjunction with each other and the weight of the load is evenly distributed between the axles of the vehicle and the axles of the trailer. This is very important because normally when you connect a trailer to a vehicle using a traditional hitch the weight of the trailer causes the front of the tow trailer to be raised and the rear of the trailer is lowered. This reduces your steering control and can be dangerous. The design of the e2 makes setting up the sway bar easier to do so you can make any necessary adjustments to keep the trailer perfectly controlled behind your vehicle. This device can be used with travel trailers, equipment trailers, boat trailers, and just about any trailer you can tow. It improves your safety and protects your valuable trailers and vehicle from possible damages. You can create a perfect leveling condition between your vehicle and your trailer using this weight distribution bar and sway control kit. The most impressive feature of the Curt MV black round bar is the self-lubricating technology designed into this system. It has a grease zerk fitting that keeps the moveable parts of the fitting perfectly lubricated so you do not forget to lubricate your fittings and reduce the lifespan and functions of your hitch. Your spring bars will always be lubricated and in top condition allowing you to tow your camper trailers, pop-up trailers, boat trailers, ATV haulers, car haulers, and equipment trailers with no hassles. The adjustable shank on this weight distribution bar will allow you to connect it to the majority of all vehicles and trailers and still have the perfect connection and vehicle control. 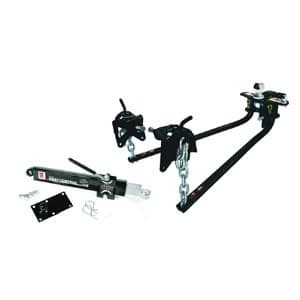 It is perfectly compatible with the majority of class 3, class 4 and class 5 trailer hitches. 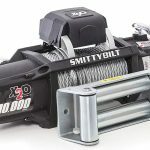 You do not have to worry about the heavier loads connected to a class 5 trailer because this unit is designed to handle a 2 ½” weight distribution shank like many of these trailer hitches require. The chain hookup brackets provide the perfect amount of tension to help level your load and keep you and your belongings safer when you are traveling. This no sway distribution bar is self-adjusting so you always have the optimum amount of sway control when you are towing a trailer behind your vehicle. The Anderson weight distribution hitch has a four inch drop and it will provide you with the most anti-sway and anti-bounce possible. Once the weight distribution bar has been installed you never have to worry about greasing anything because it is a maintenance free self-lubricating system. The ball and coupler move as one piece so there is no need for greasing, and when you are ready to remove the weight distribution hitch from the towing vehicle you will only need to remove one pin and the job is done. 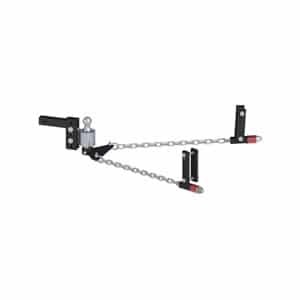 If you need to simply tow a trailer but do not necessarily need any weight distribution you can use this hitch as either a weight distribution hitch or as a standard ball mount hitch. It is versatile and eliminates the need for more than one hitch on your towing vehicle. This unit weighs less than sixty pounds but is capable of towing and pulling up to 14,000 pounds. It provides you with the safety and peace of mind you need while you are towing any trailer, and yet it still looks good, it is light and easy to remove from the towing vehicle, and it provides the most anti-bounce and anti-sway available out of a anti-sway bar. When you connect a trailer to a towing vehicle there is a good chance that the pulling weight will be concentrated on the rear axle of the towing vehicle and this can cause you to have trouble controlling the towing vehicle. Plus the front portion of the trailer may lift up some and the rear portion of the trailer may be lowered and this causing difficulties in driving over railroad tracks, or uneven surfaces, and it really causes complications when you go to back the trailer up. The only solution is to distribute the weight of the trailer between the axles of the towing vehicle and the axles of the trailer. This will level the trailer out so it can easily traverse the roads and it can be smoothly backed up and parked when it needs to be. 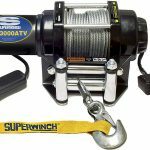 You need a weight distribution hitch to help you create these easy towing possibilities. You want to get a device that is self-lubricating if you can. The self-lubrication will allow you to have a device that lasts longer even though it is exposed regularly to dust, dirt, grime, water, and elements like snow. The best weight distribution and anti-sway hitch are not accessories that make towing easier on you. These items are crucial safety features that will protect the towing vehicle, the trailer you are towing, your family and the other people who drive the road beside you. You reduce the risk of accidents caused by towing by as much as 75% when you use these items to help you have the ultimate control of the trailer you are towing. These items not only improve your safety while you are towing they help reduce the possibility that the axles of your towing vehicle will be overloaded and damaged because you pulled too much weight with them. These items save lives, they save property, they save worry and stress.